AUTOMATIC SLIDING DOORS NOT ONLY MAKE ACCESS EASY FOR ALL USERS, BUT ALSO GUARANTEE RELIABLE CLOSURE, CREATING A SENSE OF EFFORTLESS CONVENIENCE TOGETHER WITH A FEELING OF SECURITY. BBG BC automatic sliding doors. Our sliding door operators are designed to be used for a wide range of applications, and our sliding doors can be used for either commercial or domestic properties. 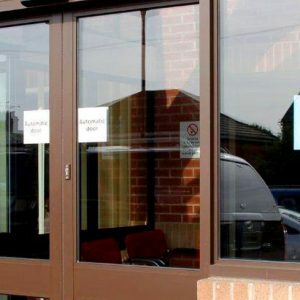 Many businesses already have automatic sliding doors, but old and tired systems can show clear signs of long term use. Their operation may be impeded by such wear and tear, potentially posing a risk to the security and safety of your business and customers. Additionally, business owners with older sliding door kits may find it increasingly difficult to source spare parts, and if they are able to, may find themselves paying over the odds for them. For clients with existing sliding doors that require some TLC, BBG we can provide a “retro-fit system” option. This entails the complete replacement of the internal electronic and mechanical components which make up the drive system (i.e. motor/gearbox, control unit etc) but retaining the existing track and cover. With a typical conversion time of around 4 hours or less, the “Retro-fit system” can reduce the level of disruption experienced by your customers and business during installation. BBG BC is an independent company. This means that, whilst many companies are obliged to stick rigidly to one product or manufacturer, we are free to choose the highest quality products from the world’s leading manufacturers of automatic sliding doors. We offer free access audits and free site surveys for all installations of automatic doors. For more information, give us a call on 1-888-224-8688, or contact us via our online form. Automatic sliding doors are seen almost everywhere. The sliding door is aesthetically pleasing and creates a welcoming and easy access to any building. The automatic sliding door can be used in any building and are popular with businesses such as hospitals and supermarkets.